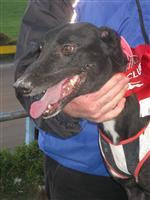 Nightrave greyhounds blog: Congratulations to Swift Fantasy! 'Swift Fantasy' (trained by Steve Clark and Kathy Wilson, on the picture above) has just won the Duke of Edinburgh Silver Collar at Manukau! Ben Craik's 'Rasmah' came second and Ray Adcock's 'Sudden Sam' third. Steve and Kathy, as well as Ben Craik and Ray Adcock are all great GAP supporters too - congratulations to all of you on great race today! We are looking forward to welcoming these amazing dogs to GAP programme once they retire!